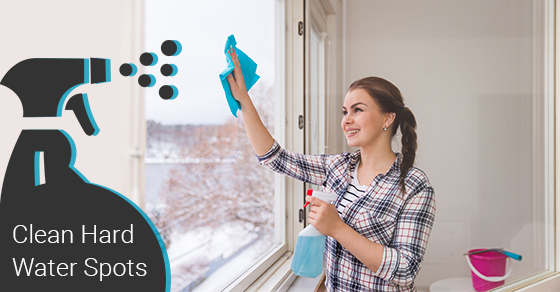 Part of your routine home cleaning schedule may or may not include the daunting task of window cleaning. Often that task is one that is pushed further and further down the list. If you are ready to tackle those hard water spots and are looking for some better solutions, well look no further! This list will give you some clarity on cleaning your glass. Cheap and Cheerful. Go old school and natural with a simple solution of plain white distilled vinegar mixed with an equal part of water. Place in a spray bottle and spray solution on glass, more-so on the spotty areas. You may have to repeat the process a few times to remove spots. It’s also helpful to saturate your cloth in the solution before scrubbing the window. If you use a rough/textured cloth you won’t have to scrub hard, the texture will help remove the spots. After you’re done, spray area with a water or heavily diluted vinegar solution and use a squeegee to remove access water for best results! Au Naturel. Another solution you can find right in your own fridge is lemon juice. Take a lemon and roll side to side on a hard surface to loosen the juice and then squeeze it into a spray bottle of water. Spritz your glass and follow up with the same scrubbing method as above. You can also use lemon or orange essential oils in place of the fresh lemon, which will add a lovely aroma to your home. Say Cheese. Did you know that toothpaste can help remove stubborn water spots? Apply your paste to the hard to remove stains and allow it to sit. After a few minutes, scrub lightly with your choice of towel, sponge or brush and then simply wash off of the windows. Remember to follow up with a water/traditional solution or either of the first two methods mentioned for best results. Weird Science. Try your hand at some chemistry by making a paste of baking soda and vinegar. The combination will react as a bubbling paste that you can apply to your water spots. Scrub lightly to remove paste, wash away with water, and follow up with a cleaning solution to remove all remnants. Go Bold. Use a store bought powdered abrasive such as Comet that can simply be sprinkled on your surface of choice, left to sit, and can be washed off after. Make sure to keep these more harmful substances out of the reach of children and pets. Clean excess off well with water. Best of luck on getting your windows spotless! Feel free to try your hand at these methods. Contact Sunrise-Cleaning for all your cleaning needs.